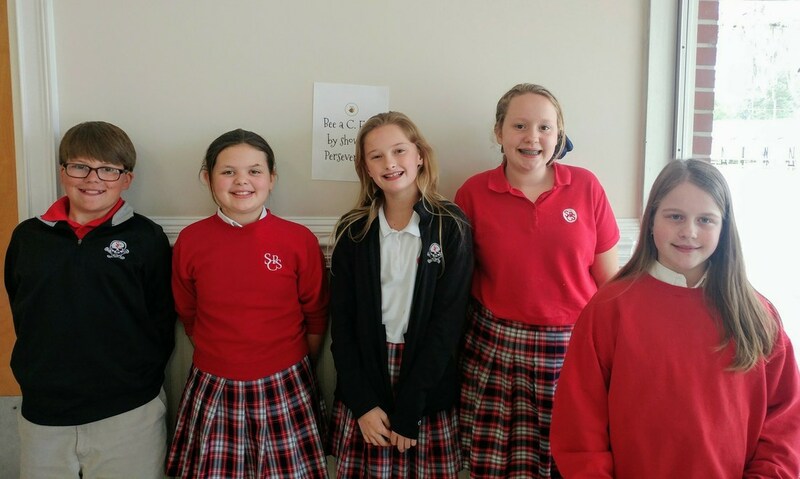 ​Today we hosted the 18th annual Quick- Think-A-Thon (QTAT) private school tournament sponsored by the Exchange Club of Savannah! Harrison Loucks represented SCPS well! Second grade students were treated to a demonstration by firefighter Ellis and Mike Chila emceed the event. 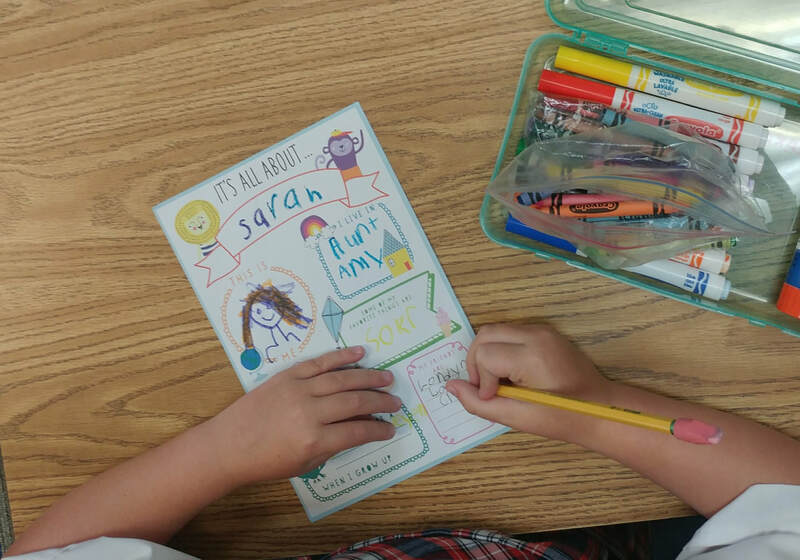 All Second Graders have been learning valuable safety information by playing the "Quick Think" game in class. Each child has been given the opportunity to answer what they think the "foozer,"our safety guide, would say in certain situations. Topics include fire safety, gun safety, stranger awareness, weather safety, and overall safety awareness information. 1. Stay low and go when there is smoke. 2. Stop, Drop, and Roll if you or your clothes catch on fire. 3. Once you are out of a burning house/ building, stay out! 4. Practice a fire drill at home! Have a meeting place. 5. Guns are not toys! 6. If you come in counter with a gun: Stop, don't touch, leave the area, and tell an adult! 7. Trust your feelings. If a situation or someone doesn't seem just right, trust your feelings! 8. Know the emergency number- 911! 9. Don't go with strangers. Create a family password to know it is safe to go with someone! 11. Report bullying to a teacher or adult. 12. Stay calm and don't panic! 13. If you get lost, go to the nearest sales clerk to help! I encourage you to talk with your child(ren) about how they should react in certain situations. The more prepared they are on how to react, the better they will be able to handle the situation! Prayerfully our students will not need most of this information. 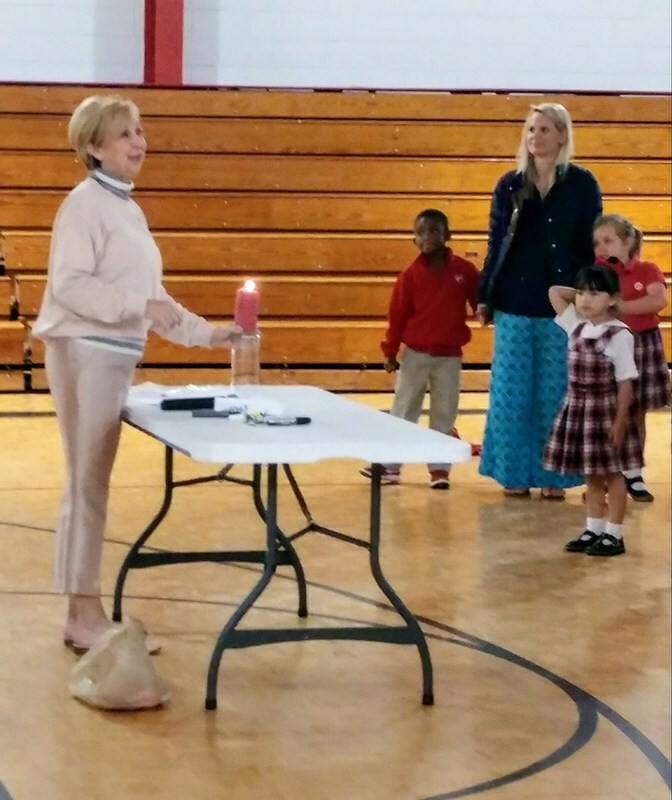 This week, Debbie Fairbanks, Director of Admissions, spoke to the lower school students at our weekly chapel program. Mrs. Fairbanks shared that we all have a light, and we all have fears and worries. She used a candle as an example for her light. Once the fears (a piece of paper with her fears written on it) crept in, her light started to flicker. She waved the paper near the flame to demonstrate how our lights can waiver when facing tough situations or thoughts. Then, she prayed. A clear plastic baggie was used to symbolize our prayers. The baggie was placed in front of the flame and then fanned again with the fears. However, this time the flame did not go out or flicker! The students then shared some of their fears. Mrs. Fairbanks wrote those on a paper and fanned the flame. She prayed for those fears and again demonstrated how our prayer is a shield against our fears. We then sang "this little light of mine". The children enjoyed singing the words and dancing! I enjoyed visiting with our 2nd - 5th grade students who have grown in the area of or demonstrated the trait of perseverance. During the regular lunch time, we enjoyed fellowship as we discussed pushing through during tough situations. The students were also given a stretchy band that displays the four Honor Code traits. Perseverance relates to how we show scholarship by doing our best! For the rest of the year, we will focus on leadership. Our focus verse is from 1 Timothy 4:12, "Don’t let anyone look down on you because you are young, but set an example for the believers in speech, in conduct, in love, in faith and in purity." Leadership is defined as the act of guiding or directing. Students are learning that we lead by our example. Our hope is that others will see our light, will see Jesus in us, and will want to know and have a relationship with Him! We are also focusing on how do we know how or where God is leading us. We have learned that the best way to know where He is leading us is to be doing what He has already instructed us to do! This includes giving thanks in ALL circumstances, making disciples of all nations, loving one another, forgiving others, admitting when we are wrong and have sinned, and becoming a new creation in Him! I have challenged our students to think of the leaders in their lives. What makes you admire that person and follow their lead? Most often, students say because they love me and I trust them! We have encouraged the students if they have questions or want to know more about having Jesus in their hearts to reach out to their teacher, Miss Knight, another faculty member at school or me! We are grateful to partner with our families to develop the whole person to the glory of God! During the month of March, we are focusing on developing perseverance! The focus verse is Colossians 3:23 Whatever you do, work at it wholeheartedly as though you were doing it for the Lord and not merely for people. Perseverance is defined as continued effort to do or achieve something even when it is difficult. In chapel today, we read the story The Little Engine That Could. We were reminded that with focusing on Jesus, we can achieve! The little blue engine showed a growth mindset of "I think I can" when pulling the train full of toys and food. We also saw the little toy clown show perseverance by continuing to seek help, even when it was hard and when he had been told no several times. Just like the clip from the movie Finding Nemo, we can remind ourselves to "keep swimming"... to run the good race! We know God has already won and we can persevere because He never gives up on us! What a blessing! I encourage you to talk with your children about persevering. Ask about a time that something was hard for him or her. What did he or she do to keep working? Did he or she give up? If so, how did that make them feel? It isn't always about wining or even making it to the goal, but more about the effort given in the process. How did your child feel if they did achieve the goal knowing they gave their best. What a difference we may see in our children if we encourage them to give their best every time, to not give up, and the reward comes from the effort and attitude not always the win! I look forward to seeing our children grow this month. I encourage you to learn more about the difference between a fixed and a growth mindset. Ask your child! We will continue to seek after Him and grow in Him! 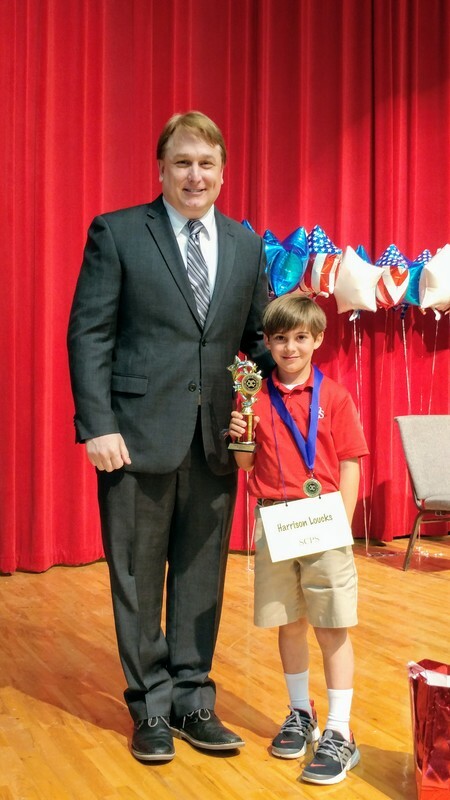 I enjoyed visiting with students in 2nd - 5th grades who were recognized for being a peacemaker or growing in this area. The students and I talked about why they were recognized. I even got to play a game of phone tag or would you rather with some of the 4th and 5th graders! We are grateful to have our students working on developing Christ-like traits in order to glorify God and be examples to others! 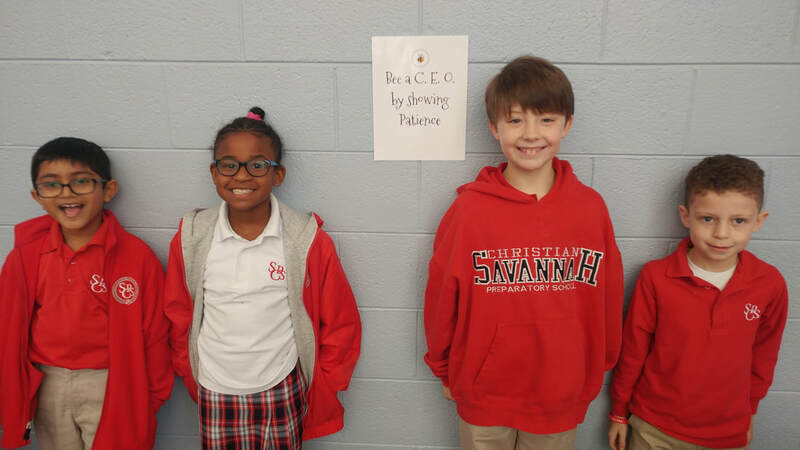 During the month of February, we are focusing on our C. E. O. trait of being a peacemaker. If you don't know what a C. E. O. is, I encourage you to ask your child to tell you about it! Students are learning what it means to be a peacemaker, scripture that encourages us to be peacemakers, and how to become a better peacemaker. 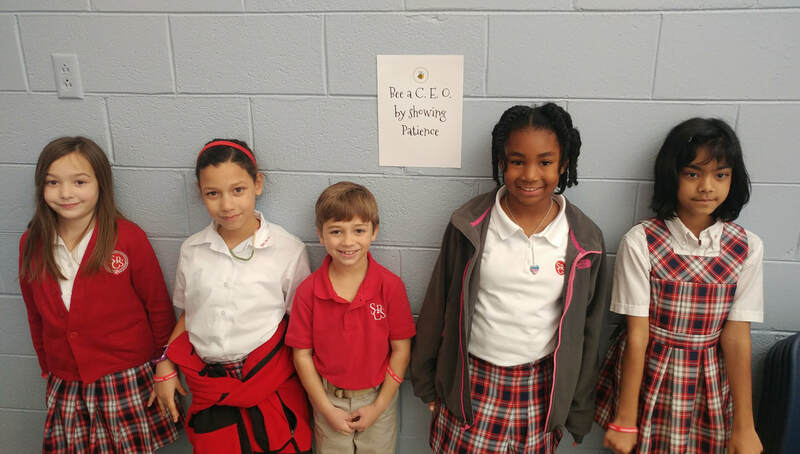 I recently visited the second grade classes to follow up on our chapel program about being a peacemaker. During the class lesson, the students engaged and discussed several concepts about being a peacemaker vs a peace-breaker. As we discussed peace-breakers, we reviewed the topics of bullying and tattling vs reporting. I hope your child shared with you something they learned from the lesson. - Bullying is when someone repeatedly and on purpose says or does mean or hurtful things to another who may not be able to defend himself or herself. - Mean/ Rude behavior is when someone says or does something unkind (usually happens once and may not be on purpose). *Students were asked what to do if someone is being unkind to you or someone else. 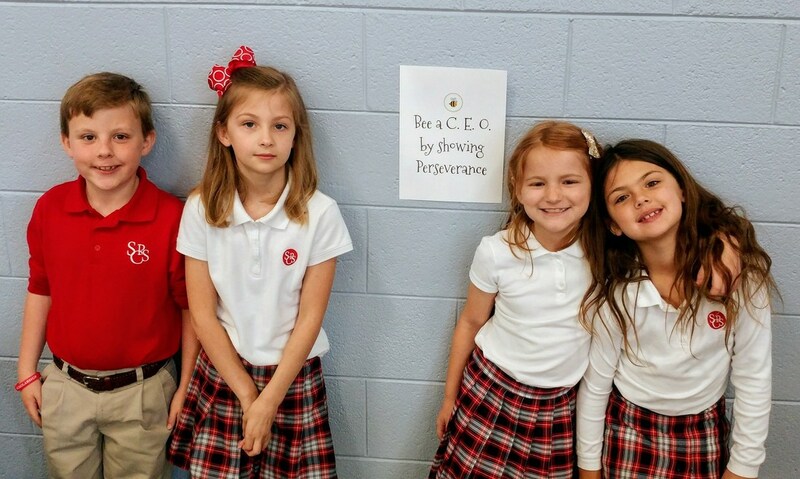 The children responded with "ignore it, walk away, let the person know you don't like it, and tell the teacher." We discussed how to let someone know when you don't like something he or she is saying or doing. Ask your child. what is an "I" statement? (I don't like it when you ____________, please stop.) We also talked about checking things out with our peers. Sometimes people/ children are not aware that they are bothering someone. By simply checking it out, we can avoid other problems. For example, If someone gave you a mean look, you could ask the person about it rather than thinking the worst. Say something like, "I just wanted to check things out with you. The look you gave seemed like you were mad or angry." - Bystander- EVERYONE ELSE -The bystanders have the greatest number and should have the most power. We discussed standing up for others or finding help if we see someone being mistreated. - Physical- hitting, kicking, pushing, tripping, etc. Tattling is telling to get someone in trouble. Tattling is often something that is not important such as someone is not in the right place in line. Reporting is telling the teacher because someone is being hurt or is in danger. And we discussed if they weren't sure if it was tattling or reporting, report it and the teacher can help the child understand if it was tattling or reporting. We strive for all children to feel safe at school and they should feel safe reporting acts of unkindness. Do they understand the difference between bullying and someone being mean/ rude? Who would your child go to if they were being mistreated? The nearest adult is the best resource. However, some students may feel more comfortable talking with someone else (classroom teacher, enrichment teacher, Mrs. Burnsed or Miss Knight). There are many adults who love your child! What would your child do if he/ she was being mistreated? In February, we are focusing on being a peacemaker! Students will hear a daily announcement as well as Raider Report segments that will encourage us to be better peacemakers! Mrs. Gaskill, SCPS Communications Director, spoke at Chapel on January 31. She read the story, Mrs. Fox's Peace Week. The children learned that we all choose to respond to situation and/ or people. We can be peacemakers or peacebreakers! Ask your child to show you the symbol/ sign for each! I encourage you to check in with your child. Find out if he or she can tell you what it means to be a peacemaker. I enjoyed visiting with 2nd - 5th grade students who were recognized for working on being patient or who have consistently demonstrated patience! This trait is hard for many of us! I am so proud that these children are listening for God's direction and following His plan on how they should respond! The boys and girls received a stretchy band that displays the school's Honor Code traits! All of these traits come from and show love. By being patient, we show Honor and Respect! In December, I was delighted to host and visit with the first group of C. E. O.s during lunch! Each child was selected by their homeroom or enrichment teacher. 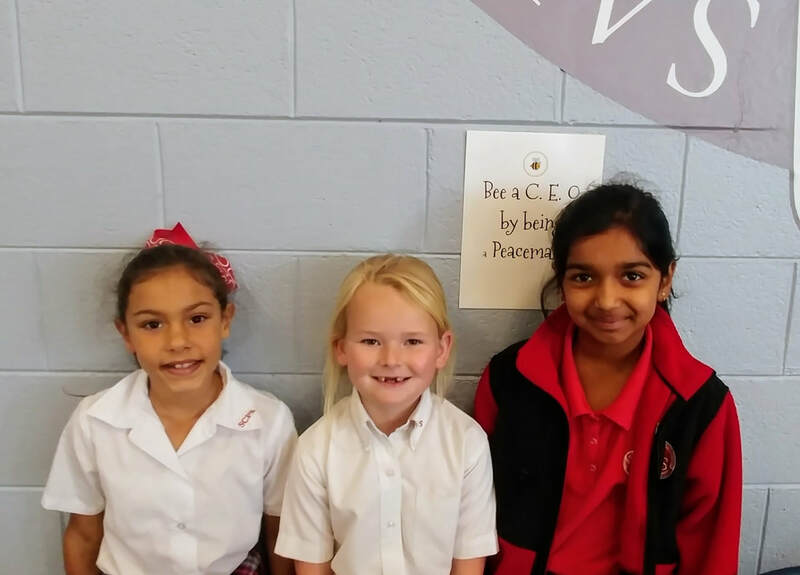 The children were recognized in their classrooms for growing in the area of being truthful or consistently demonstrating truthfulness. 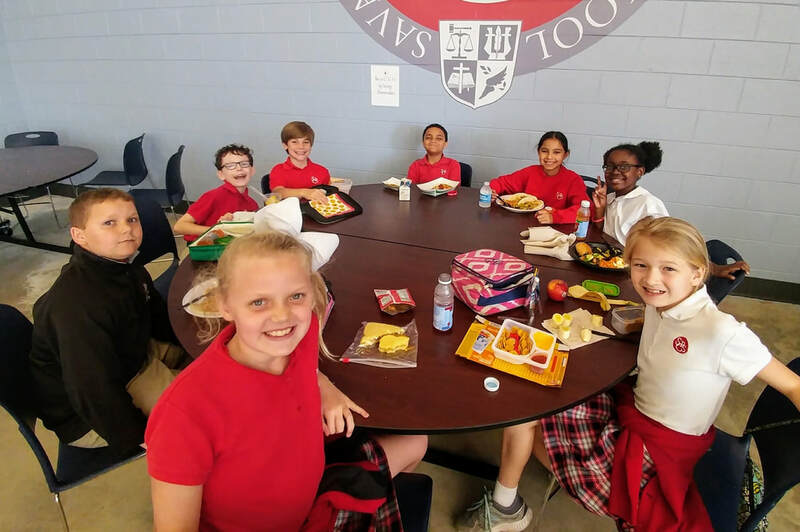 At lunch, I enjoyed hearing about how and why each child was selected. 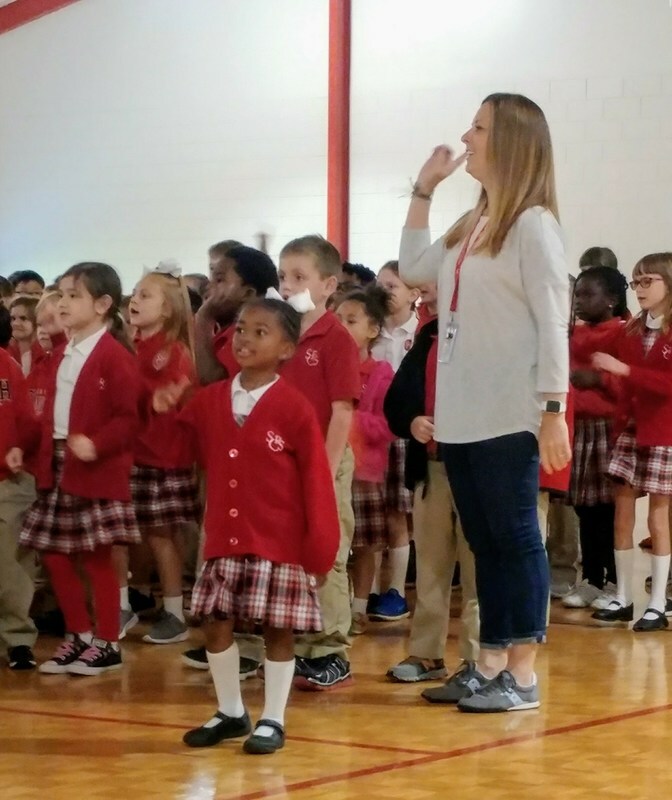 The children were given a stretchy band that displays the four Honor Code words along with #reptheprep etched on the inside. I am so proud of our children for understanding that we are ALL works in progress! I am grateful that He is still working on me! This year we are focusing on honoring God by developing a Christ-like spirit. The school Honor Code focuses on four characteristics: Honor, Respect, Truth, and Scholarship. All of our C. E. O. traits are part of these Honor Code characteristics. Each morning we speak a few words about the month's trait on the morning announcements. The Raider Report (the school news show) features a segment dedicated to developing a Christ-like spirit. 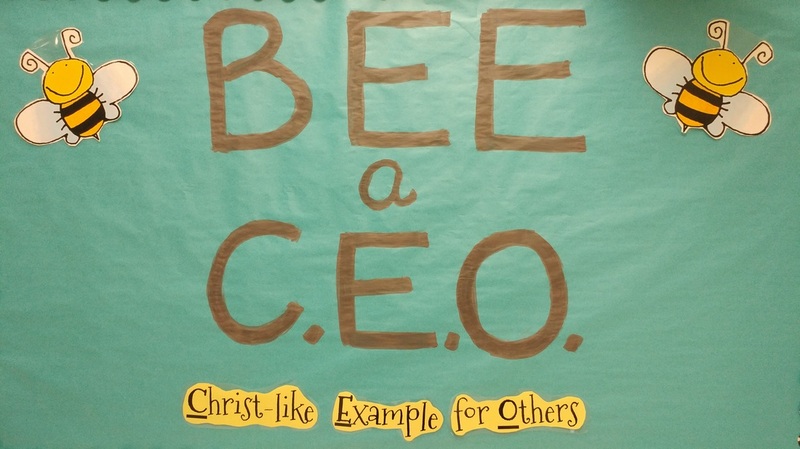 Our chapel programs are also a great opportunity to reflect on God's word and working to become a C. E. O. The Traits and verses for the 2017-2018 school year are listed below. 1 Timothy 4:12 Do not let anyone look down on you because you are young, but be an example for other believers in your speech, behavior, love, faithfulness, and purity. I have enjoyed visiting with the students! Carpool and lunch time offer a great opportunity for me to interact with your children. This week I have started my first classroom counseling sessions. The children will learn about my role at our school. I am here to help our children develop to God's glory! We will read Hooray for You and discuss how they are each wonderfully made in God's image! Our discussion will include points like how we are all unique, God has a plan for us, and how we are His creation made to glorify Him! The children will then complete an all about me snapshot. This snapshot will help me get to better know the children. It will be interesting to see if some of their answers are the same near the end of the year! SCPS is proud to host the annual Quick-Think-A-Thon tournament sponsored by the Exchange Club of Savannah on Tuesday, May 2nd at the Eckburg Center! All Second Grade students will attend this event. One student will be chosen to represent SCPS in this tournament. Welcome to a new year! I am so happy to have your child(ren) with us! It is truly a privilege to be a part of a team working on your child's behalf! What a blessing to work at a school with a mission to develop the whole person to God's glory! I look forward to seeing God's plans for this year!